We made it to CES Unveiled earlier this afternoon. There were about 60 companies represented showing their wares. The big item this year seems to be personal and home entertainment as evidenced by the 20+ iPod related items on the Unveiled Arena. Some of them are classy, some of them are large bulky yet powerful and multifunctional. Once such item that is really more of a home entertainment center (although it doubles as a fridge sized iPod dock) is the ITC One from SE2 Labs. This device comes with an XBOX 360 and can do much more than that. It can house a Wii and a PS3 as well as a ton of other hardware. Custom build your home theater system today, with SE2 Lab's ITC One—the first fully personalized, fully integrated, all-in-one box home entertainment center available anywhere. 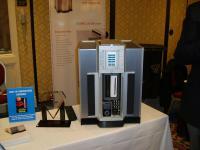 ITC One gives you a houseful of components in one, streamlined unit. No need to punch holes in your walls. No need to pull up your carpets. You can just plug it in and start playing with every audio and video component you'll ever need. Technically they would still need speaker and display wires just not a rack full of rats nest. This comes with HD PVR and a ton of more stuff - all for a low, low MSRP of $25,000USD. Yup, more than I paid for my 2007 Ford Explorer LTD.
Next up we stopped by the e-Detail booth and checked out their Prezenter PSR and their Multi-Web Pad PC's. These are geared more toward the retail market such as Consumer Sales, Insurance Sales and such. It is designed with the idea that a client looks at the larger screen and the presenter looks at the smaller screen while presenting face-to-face. It's a good idea that has other applications as well. The second screen can be cloned or run as an extended desktop with makes multitasking and monitoring of your hardware, video and other applications super easy. You can be working on the large screen, while you play your favorite movie on the top, smaller screen. The Wireless USB Alliance was present and proudly showing off Wireless USB hardware that is already available for purchase in the retail channel. 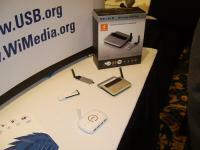 They had products from Belkin and D-Link on hand with some hardware from IOGear missing in action. There are many more companies that will jump on this bandwagon in the near future and there is a good reason. 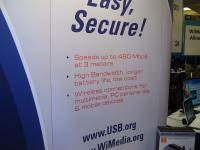 Wireless USB debuts as 480mbps - the same as standard USB2.0. It also has economical battery consumption, and is secure. When asking Jon Kenton about the security features, he noted that the security was 128-bit AES. This encryption is not software based that relys on your computers CPU, instead each wireless device is able to decrypt and encrypt as necessary. The encryption is also scalable and can already be managed at 256-bit AES with the potention for greater levels of encryption. 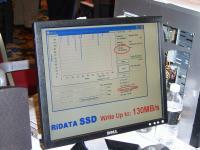 Lastly, I fought my way through the crowd at the RiData booth and they were showing off some very impressive performance on their latest generation of SSD storage. With their latest hardware they are able to write to the drive at an insane 130MB/sec and read even faster at an unbelievable 267MB/sec. These drives won't be available in retail channels for a while yet, but with these kinds of write speeds, no one could afford them anyway. 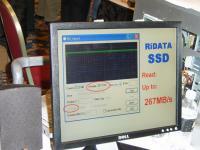 RiData said they would send us samples of these drives as they come off the line, and we are going to hold them to it. We hope to have samples by March, but anything can happen. That's it for me today from CES Unveiled. We've got a couple of press conferences tomorrow and of course the keynote speech later on. Make sure you check back often for all of our Daily CES Coverage, and if you're tired of reading, catch the latest pictures in our CES 2008 Gallery.